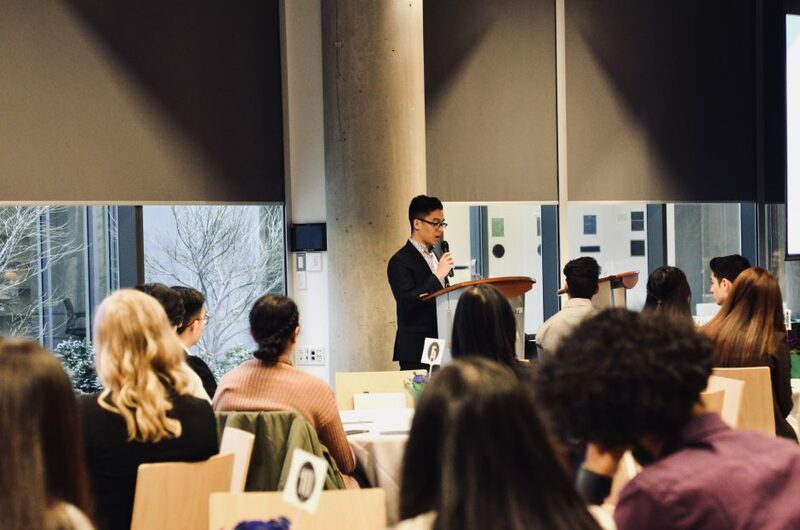 On March 7, 2019, the School of Kinesiology returned to the Ponderosa Ballroom to host its 10th annual Student Leadership Recognition Evening. This event recognizes the commitment, dedication, and service of undergraduate Kinesiology students who have held a leadership role within the School of Kinesiology or the Kinesiology Undergraduate Society (KUS) throughout the 2018/2019 academic year. Student leadership and community engagement are core tenets that are deeply embedded into the School of Kinesiology’s culture and this was evident during the evening’s program, where 215 students were recognized for their involvement, many holding multiple roles in a variety of program and service areas. A new addition to the program was the recognition of a select number of students who went above and beyond their roles to demonstrate exceptional leadership in one of three categories: Emerging Leader, Group Leader, or Community Leader. In total, 34 students were recognized and acknowledged for their contribution to increase the foundational strength of the School and the programs and services it delivers. The evening also welcomed back one of our esteemed young alumna, Sarah Richter, who graduated with a BKin in 2017. Richter shared with the group her experiences as an active volunteer within the KIN community and how it expanded her world view here at the School.